1. The Mikado, Act L: "If You Want To Know Who We Are / A Wand'ring Minstrel"
2. The Mikado, Act L: "Behold The Lord High Executioner"
3. The Mikado, Act L: "Three Little Maids"
4. The Mikado, Act L: "Were You Not Ko-Ko Plighted"
5. The Mikado, Act Ll: "Braid The Raven Hair"
6. The Mikado, Act Ll: "The Sun Whose Rays"
7. The Mikado, Act Ll: "Here's How De Do! / Mi Ya Sa Ma / A More Humane Mikado"
8. The Mikado, Act Ll: "The Flowers That Bloom In The Spring"
9. The Mikado, Act Ll: "On A Tree By A River"
10. 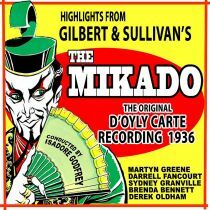 The Mikado, Act Ll: "For He's Gone And Married Yum Yum"